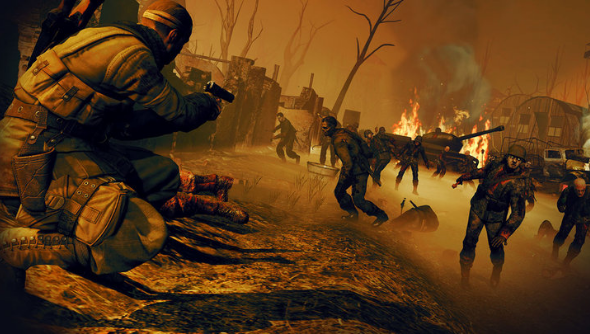 If you’re a crack hand with a scoped rifle and love some x-ray kill-cam gore you’ll be well catered for this Halloween, as Sniper Elite: Nazi Zombie Army is being dug up and shot with lightening bolts to be resurrected as a sequel. On the 31st October, you’ll be able to march back to Berlin for Nazi Zombie Army 2 through the use of purchasing aids Steam or the Rebellion store. The title tells you pretty much everything you need to know about it: there’s lots of sniping, and the enemies are Nazi zombies, and there’s quite a few of them. This time around though there will be more grisly types to mow down, including a Fire Demon and a Summoner. Naturally they all require killing, and a slow-motion kill-cam is there to make the whole activity even more horrifyingly awesome than it already is. I’m currently playing through the first one with a co-op buddy, and whilst it is all fairly one-note, it’s good fun and still manages to require some measure of skill with a rifle despite the enemy’s shuffling, brain-lacking nature. Pre-purchase the game from both Steam and the Rebellion store and you’ll be able to get 20% off the £9.99 price tag.